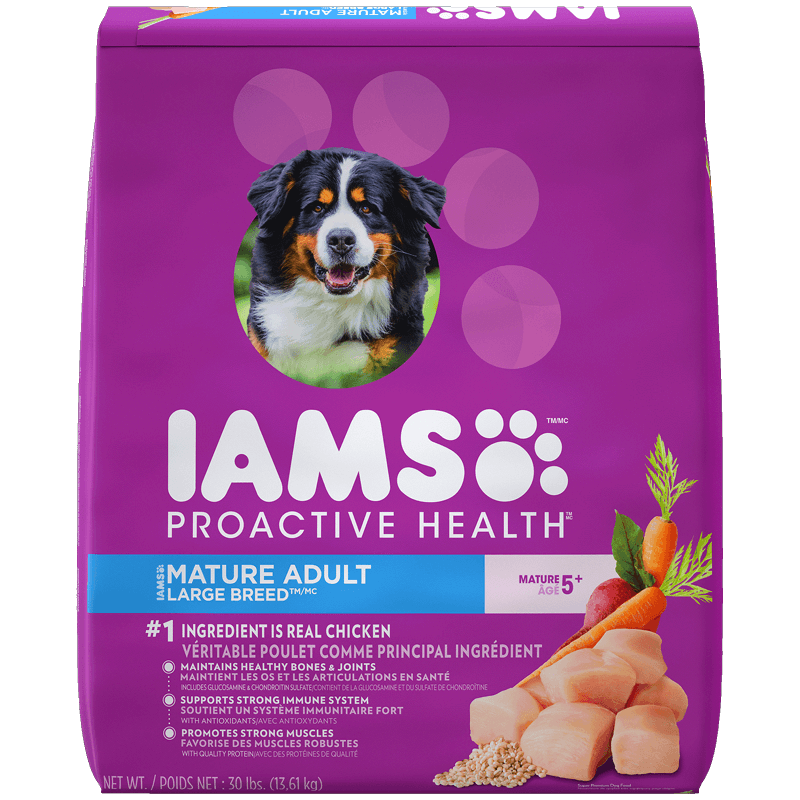 IAMS Mature Adult Large Breed nurtures your dog’s bones and joints through specially formulated nutrition with natural sources of glucosamine blended with fat-burning L-carnitine to help keep him fit, active, and living large. This is a great alternative to the PROACTIVE HEALTH™ SENIOR PLUS. 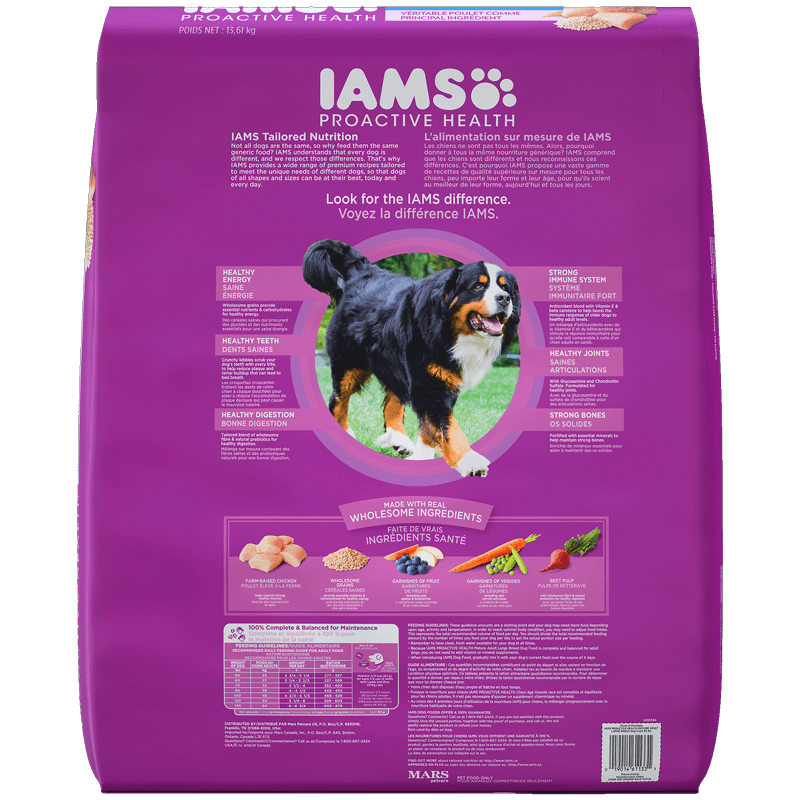 Here you’ll find the same high-quality, tailored ingredients that ensure your dog is always at his or her unique best. Formulated to nourish healthy joints. Corn Meal, Chicken By-Product Meal (source of Chondroitin Sulfate and Glucosamine), Ground Whole Grain Sorghum, Chicken, Dried Beet Pulp, Ground Whole Grain Barley, Chicken Flavor, Dried Egg Product, Chicken Fat (preserved with mixed Tocopherols, a source of Vitamin E), Brewers Dried Yeast, Potassium Chloride, Salt, Sodium Hexametaphosphate, Flax Meal, Calcium Carbonate, Fructooligosaccharides, Choline Chloride, Minerals (Ferrous Sulfate, Zinc Oxide, Manganese Sulfate, Copper Sulfate, Manganous Oxide, Potassium Iodide), L-Lysine Monohydrochloride, Vitamins (Ascorbic Acid, Vitamin A Acetate, Calcium Pantothenate, Biotin, Thiamine Mononitrate (source of vitamin B1), Vitamin B12 Supplement, Niacin, Riboflavin Supplement (source of vitamin B2), Inositol, Pyridoxine Hydrochloride (source of vitamin B6), Vitamin D3 Supplement, Folic Acid), DL-Methionine, Vitamin E Supplement, L-Tryptophan, Beta-Carotene, L-Carnitine, Citric Acid, Rosemary Extract. 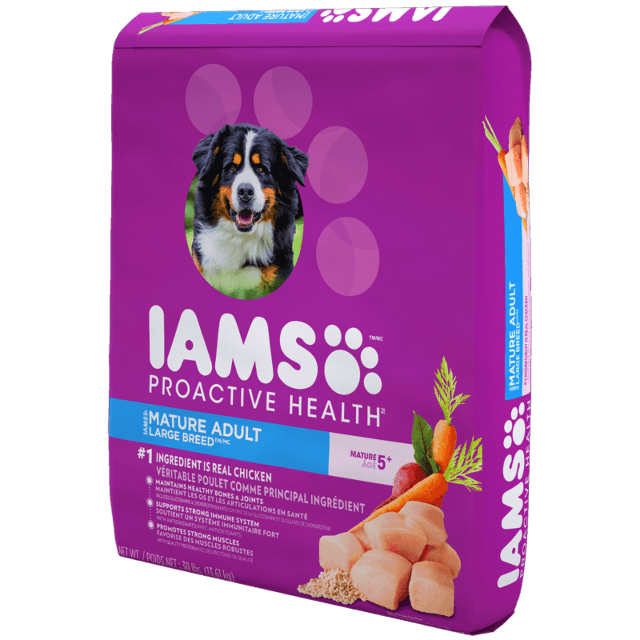 Because IAMS ProActive Health Mature Adult Large Breed dog food is complete and balanced for adult dogs, you do not need to add vitamin or mineral supplements.